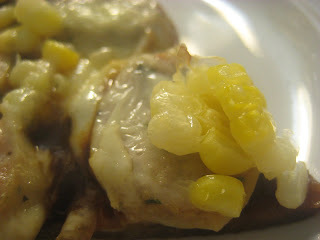 One of my favorite 'guilty pleasures' is the Barbeque Chicken Pizza from California pizza kitchen. I even like the salad of the same flavor. Something about the smokey barbeque sauce just appeals to me...I can't get enough! I got a craving early in the week and couldn't shake it....But I also couldn't justify spending $14 on some froofie pizza pie. I had some trader joe's pizza dough in my freezer - whole wheat. I also had 2 ears of organic corn from my CSA which I needed to eat rather quickly so they wouldn't get all gross and starchy. There were 2 leftover links of chicken sausage (garlic variety), half a red onion, and some low fat cheddar and regular parmesan cheeses in the fridge. Since all my pizza components were already cooked and I just needed to warm them through and melt the cheese, I didn't want to end up with an unbaked crust. I defrosted the pizza dough and rolled it out. I put some cornmeal on my pizza pan and blind-baked the crust for about 7 minutes. I then spread a very thin layer of barbeque sauce on the crust like you would marinara on a regular pizza. 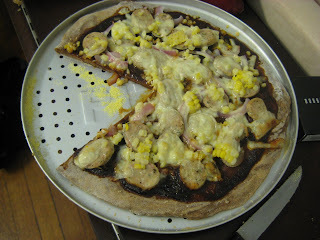 I then topped this with the sliced rounds of sausage, the cut corn, chopped red onion, and finally a layer of cheese. I baked it in the oven for another 8-10 minutes, until the crust was crispy and the cheese was bubbling. It definitely satisfied my craving for takeout...and by using the ingredients I already had in my kitchen, I saved myself $14!!! I ate the pizza for dinner, and again the next day for lunch at work. Considering that I already have a HUGE bag of whole wheat flour, and I bake very rarely, I think I need to make some of my own pizza dough to keep in the freezer for cravings such as these. 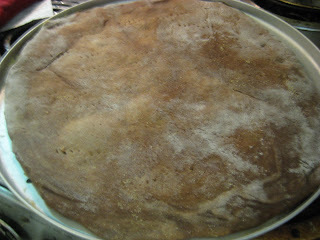 I have definitely made dough before - but I don't recall any recipe blowing me away. 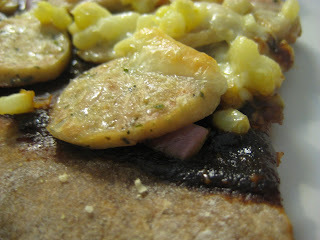 Does anyone have a go-to recipe for whole-wheat pizza dough? That looks/sounds delicious! You're making me remember some of the meals I used to eat when I lived alone. It was perfectly acceptable to have plain white rice mixed with butter and salt and pepper. Or a hunk of bread, some cheese, olive oil, and tomatoes. And when truly lazy, a can of Progresso Chickarina soup.